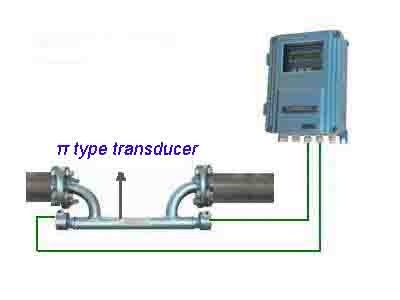 For large quantity and low cost application, it is better to select low cost unit flow converter as main converter. (10). Suitable for clean liquids and liquids with minor particles. 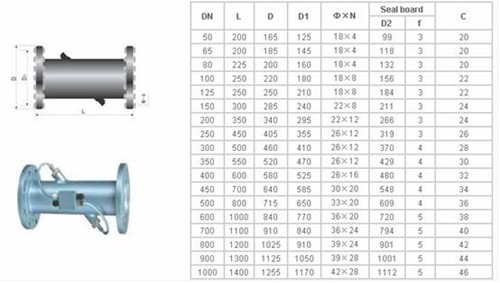 Ultrasonic inline flow meter utilizes a flow cell (or so-called spool-piece) where transducers are already built-in. The big advantage are its high-accuracy and long-term stability. 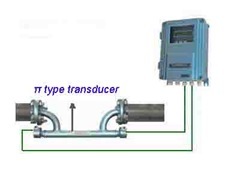 It is calibrated in factory and no extra error will be introduced by installation. Since it is still non-invasive, it does not generate any disturbance or pressure drop to the flow. 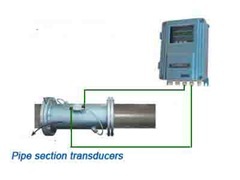 The inline flow meters are usually wall-mount type or permanent-installation type, thus are ideal for long-term deployment for flow measurement and closed-pipe applications, such as liquid process control, water flow measurement (hot/chill water, city water, sea water), sewage and sludge measurement, and measurements of oil (crude/diesel/fuel), chemicals (alcohol, acids, etc. ), beverage, and many other liquids. The ultrasonic inline flow meter is available for pipes DN15- DN1000mm,but in regard of better shipping cost ratio, clamp on ultrasonic flow meter or insertion flow meter is recommended for bigger pipe size,.e.g when pipe over DN200mm. Of course, this is not absolute rule and follow your detailed requirement.